Gloxinia rubra (Paxton, 1841) is the source of the red color in modern hybrids of Sinningia speciosa. All of the descriptions from the mid-1800s refer to the newly-opened flowers being deep red with some blue in the throat, fading to an attractive rosy red as the flowers age. Many species in the genus Sinningia have red or red-orange flowers. Examples are S. aggregata, S. cardinalis, S. cooperi, S. macropoda, and S. reitzii, to name a few. In S. speciosa however, the corolla color generally ranges from light lavender to dark purple, depending on the population. 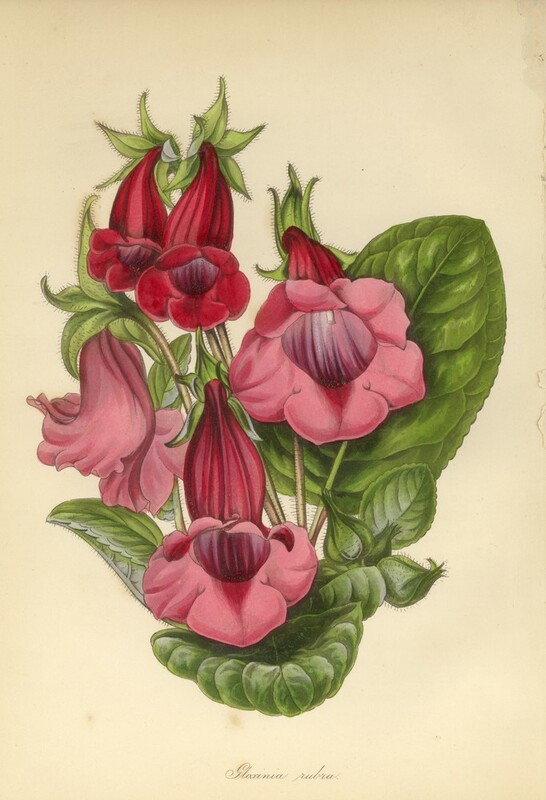 Any other color is quite rare; as mentioned in the previous section, there is an illustration of a white-flowered plant from 1833 in Curtis’s Botanical Magazine of Gloxinia speciosa var. 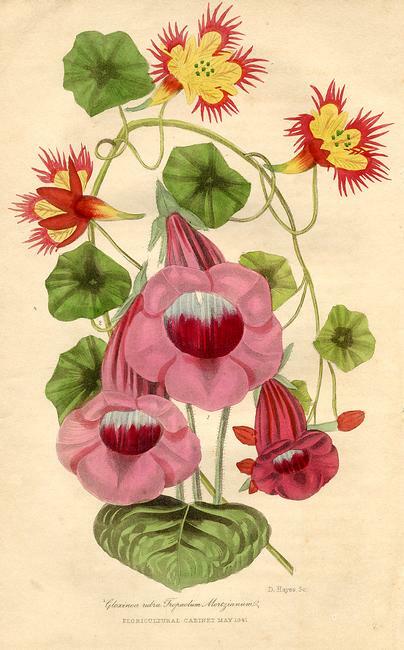 albiflora (plate 3206), and only one population, from near the town of Cardoso Moreira in Rio de Janeiro state, is presently known to contain plants with pink flowers. So why do many of the “florist’s gloxinias” sold today have dark red flowers when this color is not found in the wild? The answer comes from an account published in 1886 by W.D. Brackenridge in The Gardener’s Monthly and Horticulturist (vol. 28) entitled, “A Chapter in the Secret History of the Gloxinia”. Brackenridge describes his discovery of Gloxinia rubra (aka G. speciosa var. rubra) while he was the assistant botanist on the United States Exploring Expedition (also known as the Wilkes Expedition) in 1838. G. rubra was found growing among a large population of purple-flowered individuals of G. caulescens (=S. speciosa), on wet rocks at the base of Corcovado Mountain in Rio de Janeiro. It was the only red-flowered plant found, and he [correctly] considered it to be a “mere sport or variety” rather than a new species. There are several published descriptions of G. rubra, all of which describe the flowers as being “a deep rich blood-red colour” when they first open, later fading to crimson with a small amount of blue in the throat. Gloxinia rubra was published and illustrated many times. In this instance, from the Floricultural Cabinet (1841), it was accompanied by an illustration of Tropaeolum mortzianum. Brackenridge expressed the view that G. rubra should be crossed with other types of G. speciosa in cultivation to produce “intermediate varieties”. He goes on to describe how he sent the tuber to his friend and former employer, Robert Buist in Philadelphia, who was able to propagate it. Buist then sold the entire stock to Hugh Low, a nurseryman in England, for £40 sterling, unaware that some leaves had been stolen by persons unknown. When G. rubra turned up for sale at another English nursery, a financial dispute ensued which was only resolved when Mr. Buist refunded some of the money he was paid for his plants. According to the article describing G. rubra in The Floricultural Cabinet (volume 9; 1841), this plant originally sold for three guineas each, which was a very large sum in 1841 (1 guinea = 21 shillings = £1+1 shilling). No other examples of wild S. speciosa with true red flowers have ever been documented, so it is very probable that the modern florist’s gloxinia cultivars with red flowers are all descended from this one plant. G. rubra is encountered many times in the 19th century botanical literature, often in the context of its use as a parent in named hybrids. The red shades in all modern Sinningia speciosa hybrids come from the original Gloxinia rubra, now understood as a naturally occurring variant of S. speciosa. From left, Sinningia speciosa ‘Merry Christmas’, ‘Lela’ and an unnamed Charles Lawn double.